Helps whiten & clean teeth. Reaches in between teeth. Enamel friendly. Freshens breath.Experience cleaner, whiter teeth with enamel-friendly Colgate® Max White? 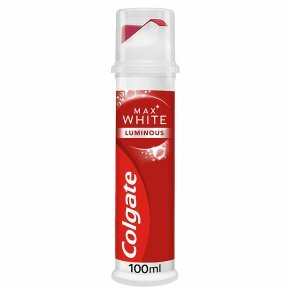 Luminous toothpaste. The SmartFoam system bursts into action to whiten and thoroughly clean everywhere, even in between teeth. It also freshens breath, so you can enjoy all-around confidence when you smile. Directions: Brush thoroughly for 2 minutes, twice a day. Not for use of children under 7 years old.